Ria Thundercloud recently gained national and international attention for her expressive style of dance. A feature article on Ria was published in the June/July issue of Glamour magazine, a magazine that highlights women’s fashion and beauty. The article tells about her love of dance and her dedication to portraying Native Americans accurately in the media. Ria, 27, is the daughter of Roger Thundercloud and Jessica Bearskin. She has a daughter, Cyra Thundercloud, who just turned 3. She goes to school in Santé Fe, New Mexico, where she is a senior at the Institute of American Indian Arts with and Indigenous Liberal Studies major. After she graduates in May, she plans to attend University of Riverside, California, to get her Ph.D. in Indigenous Dance. She began her interest in dancing when she was 13. “I went to one of my brother’s shows. He was a professional model and a performer. During the performance, a contemporary dancer came out and did this beautiful dance in a white dress – a dance I’ve never seen in my life. I told my mom that’s what I want to do when I grow up,” she said. It was through her courage and determination that she was able to gain attention on a national level. She didn’t think the opportunity would happen again, so she thought it was up to her to introduce herself to the Glamour magazine editor. “When I was talking to the editors, one specific one really liked my story, so she reached out to me shortly after that,” Ria said. “I was telling her that indigenous ingenuity, fashion, these things are appropriated so horribly through social media and media in general. “I encouraged them to use indigenous women to our good role models as people who represent themselves in a positive way. I think those are the women who represent Indian country, like real native women. There are authentic native women out there, I was thinking those are the women who never get work, never get called on. “Their stories are never told from their own point of view. Their stories are always being told through media, through screenwriters, through other actors portraying natives who are nonnatives. I feel it would be a very bold statement to use actual native people in their magazines,” she said. One of the women – Lindsey - contacted her two weeks after the show. The interview process started after that, with the photography and videography after that. “I also made a new dress for this photo shoot. It was to extend the solidarity with indigenous women, so I wore a red dress. It was intentional because I wanted to bring awareness to Indian Country but not romanticize Indian Country, but kind of be real,” Ria said. “I wanted people to see native women are resilient, but they do go through a lot of trauma and things, but I also didn’t want to romanticize, like native women being beautiful like Pocahontas,” she said. “There is substance and all native women come in all different forms – as artists and scholars and philosophers and jewelers – they come in so many different shapes and forms, so that’s what I wanted to highlight,” Ria said. The editor chose the Eagle Dance for Ria to perform because it is the most visually exciting for a magazine, Ria said, so she wanted the regal and majestic eagle wings in it. “But my favorite dance, which is what I’m focusing on right now, is my contemporary dance. That includes lyrical, modern, ballet, jazz, hip-hop, and choreography. That’s pretty much my main focus at the moment. 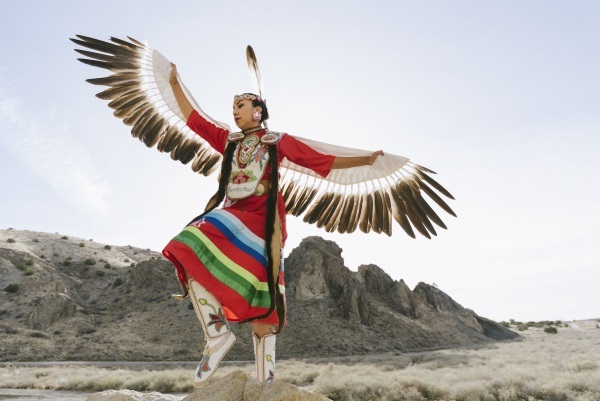 Ria has traveled the world with my eagle dance, she said, but she wants to shift away from powwow performance and immerse herself completely into contemporary dance. She believes the outside world views native people as all one type and image instead of individual people from separate nations. “It’s really hard to portray natives in such a positive form and it’s hard for nonnatives to understand. I feel that dance is such a powerful expression and an amazing way to story-tell through movement, so that’s what I want my company to do,” Ria said. “That’s what I’m trying to do is tell my stories and tell Ho-Chunk stories and tell Sandia Pueblo stories through movement and through dance and expression and through breath. So, that is my main focus at the moment,” she said.